Done well, the ritual that is Weekend Brunch—the decadent banquet of carbs and cured meats and eggs any style—is almost like a religious experience. Hordes of Hoosiers flock to wait in line at downtown hot-spots Milktooth and The Garden Table to revel in the wonders of fresh baked croissants and silky hollandaise draped over perfectly poached eggs. For quite some time, I assumed the swatch of eateries serving the best brunch in Indy were exclusive to the downtown metro area and its surrounding neighborhoods, but I recently made the trek to Fishers for a brunch that changed my preconceptions of Brunch in the Burbs. LouVino, located in the heart of Fishers’ revitalized Nickel Plate District on 116th Street, offers an inventive spread of brunch fare. Largely inspired by southern cuisine, the menu is highlighted by quintessential Southern ingredients like pimento cheese, fried green tomatoes, and fried chicken (which you can and should do tacos-style with gravy and whipped potatoes). Tired diner staples like Eggs Benedict get new life at LouVino: delicate poached eggs are paired with tomato relish and spicy chorizo atop a southern hoe cake and blanketed with a rich poblano and tomato hollandaise. This is not that tasteless, unpalatable 24-hour chain diner Eggs Benny you might be used to eating; this is the kind of exciting, thoughtful breakfast fare that is worthy of your Sunday morning. And nothing is more worthy of your weekend brunch ritual than the BLT: Perfectly cooked slabs of bacon and slices of the best fried green tomatoes you’ve ever tasted are sandwiched between a soft croissant and slathered with a splendid maple-infused whole grain mustard spread so good that I’d consider eating it by the spoonful if I could. It all comes together with a runny over easy egg because it’s brunch, obviously. It’s a behemoth of flavors and texture, and sure it’s kind of messy (you might have to knife and fork it), but it is unequivocally one of the best breakfast sandwiches I can remember eating in quite some time. (Pro tip: Order the sandwich with the loaded tots and thank me later). This reimagination of classic brunch food is what makes LouVino so compelling. Like the BLT and Eggs Benedict, the Steak and Eggs is an equally fantastic iteration of the often dry-and-chewy diner standard. Skirt steak is tender and juicy, cooked a perfect medium-rare and lifted by a savory demi-glace and a textbook fried egg. 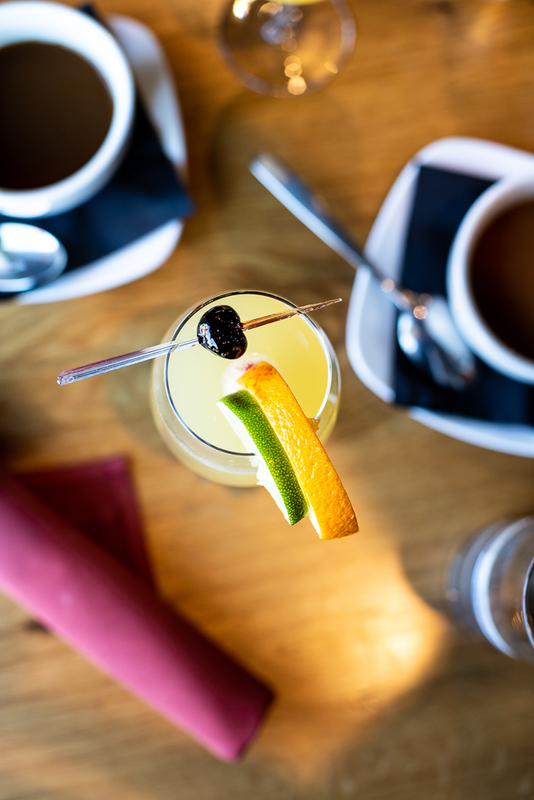 For those seeking out a boozy brunch, LouVino has you covered for your next Sunday Funday. $2 house mimosas are the crowd favorite, and the pricier iterations (I opted for the elderflower mimosa) are quite enjoyable, too. (Another Pro Tip: LouVino also offers a rosé flight, aptly named the “Axl Rosé,” that is well worth the splurge on any day of the week). The inventive bites and creative brunch spread at LouVino cement this restaurant-in-the-burbs’s ranking as one of the best in the city. Add it to your “Brunch Bucket List” with the likes of Milktooth and Rize and Delicia. It is well worth your attention, and more than worth the drive.